The Very Hungry Caterpillar is a favorite children's book It is such a great story with the most beautiful illustrations. 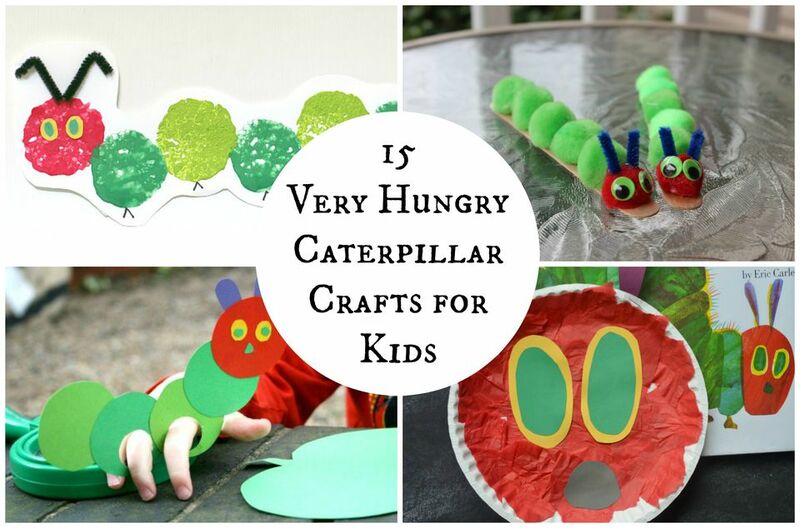 Extend the story by make one or more of these Very Hungry Caterpillar-themed kids crafts. They are all very simple to do and really kid-friendly. Have fun crafting these caterpillars with your kiddos. Cupcake liners make the perfect craft supply for this caterpillar craft. Finish off the craft with googly eyes and a cute little smile. Kids love a good paper chain craft. This paper chain looks just like a caterpillar and it's super easy to make. How yummy do these fruit pizzas look? Together they make such a cute and very hungry caterpillar. These would be a fun treat for a The Very Hungry Caterpillar-themed party. This is a super simple craft for toddlers that love reading The Very Hungry Caterpillar book. Save these crafty caterpillars for playtime at home. Crafting with marshmallows sounds like so much fun. Try this painting technique with my kiddos. Create this tiny painted caterpillar with just your fingerprints! How easy is that? Display in your child's room for decoration. The Very Hungry Caterpillar makes such an adorable theme for a birthday party. Check out this first birthday party and all of the fun caterpillar decoration ideas. This paper plate craft is the spitting image of The Very Hungry Caterpillar. It's fun, simple, and uses everyday craft supplies. Duplicate the holes in The Very Hungry Caterpillar with this fine motor activity for your little ones. Everything you need for this craft is probably already in your home. Play a few rounds of this Very Hungry Caterpillar-themed memory card game by using this fun printable. Craft this caterpillar finger puppet out of construction paper. Use the puppet to recreate The Very Hungry Caterpillar story. Your kids will love this sponge painting craft. Cut out circles from sponges and use them to stamp this caterpillar craft. Upcycle The Very Hungry Caterpillar book sleeve to make this kid-friendly puzzle. This is an easy craft with an awesome end result. Here are a ton more caterpillar ideas if you're looking to have a Very Hungry Caterpillar-themed party. Kids especially love the caterpillar photo collage! Bend pipe cleaners into the shape of a caterpillar. Then add beads to complete this Very Hungry Caterpillar craft for kids.